The website is in Chinese (I believe) and I am grateful for Google Translate because I am not proficient in Chinese. 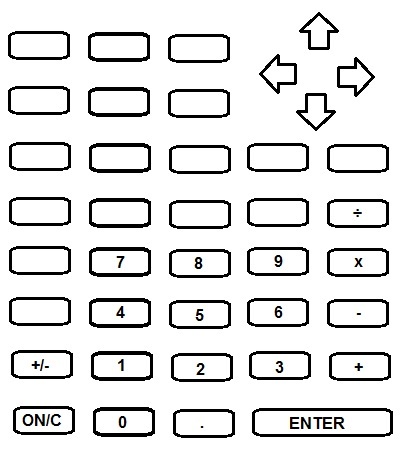 If you have a Casio programming calculator, check this awesome website out. While I was learning to code the programs myself, I notice there were several tricks that were used to save space. I want to test the tricks for the Casio fx-5800p and Casio fx-9860GII (Linear Input Mode). The case for the fx-9860GII should be the same for other modern Casio graphing calculators (9750g, Prizm). Note: Pol(1,0) sets I to 1 and J to 0 for the fx-5800p. Most Casio programming calculators have only single-letter variables, which allows for implied multiplication. For example, typing AB multiples the values stored in A and B. In the examples listed below, I use variables A and B, but it applies to all the other variables. Example: Ask for A and B. Divide A by B, unless B is 0. Connecting two or more jump functions (⇒) to create an AND condition. Example: Calculate the eccentricity of an ellipse, assuming A ≥ B. If anything improper is entered, -1 is returned. Note: This should work on any Casio calculator with M+ and M- available on the keyboard. It can be any combination! * The keyboard must be used, including the arrow keys. Assume that the calculator will have the necessary screen size. You have 16 blank keys, of course, you can/should consider using shift and alpha keys. * The keyboard has a double-wide Enter key. RPN and Hewlett Packard fans rejoice! * The marked keys must remain. Other than that, go wild! Leave your creation in the comments. In standard game of Blackjack, the main objective is beat the dealer’s hand. Usually this occurs if your hand has a better total (no more than 21) than the dealer’s hand. At any time if the total of your hand exceeds 21, you bust, or automatically lose. As your score increases, the number of cards that can cause you to bust increase. If your score is 11 or less, you cannot bust on the next card. Even if you get an Ace, Aces are 1 or 11, and are always used to your best benefit. If your score is 12, if the next card is any face card or ten, you bust. There are 16 face cards and tens in a standard deck of 52 playing cards. The face cards are Jacks, Queens, and Kings. In Blackjack, face cards count as 10 points. Below is a table of score and bust cards. If your score is 17 and above, basic Blackjack strategies dictate that you stand (draw no more cards). To calculate the odds of busting, we have to determine two things: (I) the number of bust cards that remain, and (II) the number of cards remaining to be dealt. d = the number of decks in play. Decks are assumed to standard decks of 52 playing cards, without jokers. t = your score. For our purposes, 12 ≤ t ≤ 16. Outside this range, this formula does not make sense. b = the number of bust cards used. Unless you are counting cards, this is an estimate number. Let’s calculate some approximate odds of busting. Scenario #1: The table is just you and the dealer. It is the first hand the session and 6 decks are used. On the first hand both you and the dealer have been dealt a face card. Scenario #2: Now the table are six players and the dealer. Five hands have been dealt and now we are on the sixth hand. There 6 decks being used and let’s assume that 88 cards have been used, 28 bust card used. Scenario #3: Now the table are six players and the dealer. Same as above, let’s time assume that 40 bust cards have been used, a lot of high cards have been dealt. A quick observation is that the more bust cards that have been used, the lower the chances of busting later on. Obviously, having a score of 15 or 16 is not a desirable score since the dealer stands on 17 and above. 15 and 16 are desirable if only a dealer has a weak up card (3-6) and the dealer’s chances of busting is high (assuming the hidden card is a 9, 10, or face card). And no, I don’t count cards during a blackjack game. In a real life game, I try to apply basic strategy and hope for the best. The program HERMITE2 interpolates two data points to determine the value of an unknown function at a third point. What is unique about Hermite Interpolation is that that not only the two data points are known, but the slopes (first derivatives) are also given. Hermite Interpolation will require a lot of calculations, especially when more than two points are known. We have points (x0, y0, y’0) and (x1, y1, y’1) and we want to determine y for a given value of x. The approximation of y is determined by divided differences. The arguments of HERMITE2 are as follows: x0, y0, y’0 (labeled dx0), x1, y1, y’1 (labeled dx1), x. 1. n is a positive, composite integer. That is, n can be factored into a multiplication of prime numbers. 2. n is square-free. That is, √n is not an integer. 3. For each prime factor p dividing n (not 1 or n), the following is true: (p-1) divides (n-1) evenly (without fraction). The commands isprime and ifactors are generated from the CAS-Integer (Options 6 then 1 for isprime; option 3 for ifactors) submenu. However, I think in order for this program to work properly, the “CAS.” must be deleted and the command should be in all-lowercase. ISCARMICHAEL(561) returns 1. 561 is a Carmichael number. The prime factors of 561 are 3, 11, 17. ISCARMICHAEL(778) returns 0, hence 778 is not a Carmichael number. The prime factors of 778 are 2 and 389. The curve fits points (x_0, y_0) (when t = 0) and (x_n, y_n) (when t = 1). The degree of the polynomial is n-1. The arguments given for the BEZIER program are two lists: one of x-coordinates and one for y-coordinates. The program switches to Parametric mode. In order to accomplish this, I store lists to equation variables, convert them to strings, and build a string to be converted to the equation. The commands Equ>String and String>Equ are found in the catalog ([2nd] [ 0 ]). The DelVar command can handle one variable at a time. Temporary variables (XT5, YT5, XT6, YT6, Str7, Str8, Str9, Str0) are deleted at the end of the program to save space. Disp "LISTS NOT SAME LENGTH"